In 2009 Illumion suprised the gourmets with their CD "Hunting For Significance. The quintet from North Holland treated the lovers with quality music where you have to put some effort in to fathom it. 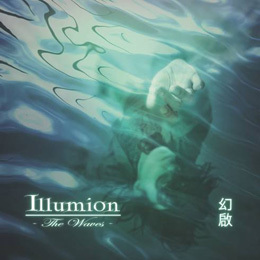 With "The Waves", which took 2 years of work , Illumion shows that they have grown as a group. You could say they've grown up. The line started with the debut album is continued. At the same time the music has become more accessible. The enlisting of Gerton Leijdekker (Ixion, S.O.T.E.) on keys and (acoustic) guitar is a smart move. The group has risen in musicality and strength. A match sparks the symbolic fire of Ember. Ultramodern synthsounds followed by the clear and powerful voice of Esther Ladiges light up the fire further. The second half of this long song consists of fluent and heavy guitars of Eveline van Kampen. With Ember it is directly clear that the group have gotten themselves more modern and heavy sound. The wonderful and varying Adamantine with atmospheric keyboards does have pointy guitarriffs of the delicate guitarist. Leijdekker's nylon stringed guitar playing is pretty in the last few minutes. The Jazzinfluences that featured frequently on "Hunting For Significance", are first heard in A Tale Of Kings. There is plenty of variety between keyboards, acoustic and electric guitar on the one hand and the (sometimes distorted) voice of Ladiges and the backingvocals on the other hand. Besides showing Illumion on its best, this song is a pure joy to listen to. The calm and, in moments, mystical sounding Sorrows End draws from another end with piano, acoustic guitar and -besides bassguitar- basspedals of Peter H. Boer. Extraordinary and rich in contrast is the piece with trumpet ans basspedals. On Espirando (which translates to 'dying off' in the music world) the quieter trend is continued at first. Gradually the power and intensity increases in this song by the vocals and dark guitarriffs. Illumion does not limit themselves to the classic rockinstruments as is obvious from the passage on the guzheng, as well as the erhu played by van Kampen, a traditional Chinese stringinstrument. Having a known name contribute to your album, always does well. Therefor Arjen Lucassen has been found willing to add some some spoken word to Mystify. That this song has an international character is proven by the spanish piece and the Chinese sounding ending. The last and titelpiece The Waves is the most symphonic and orchestral one of the album. Besides the prominent place for the previously mentioned erhu some fierce guitarsolos are heard. Compared to the debut there is also vocal improvement , which is shown by the backingvocals of Leijdekker and Boer. With "The Waves" Illumions shows that the band has evolved, including a recognisable signature sound. The music has become more accesible and more varied compared to the debut. Further 'consessions' have not been made. You still have to spend an effort to let the music get to you. Easy listening or background music will not be made by this group. Illumion is a luminous star at the Dutch musicheaven. The cd that was reviewed here is, at the time of publication of this review, only available as a bonus with the double vinyl release of Freia Music. This label specialises on vinyl releases. The vinyl version contains two extra songs that are not found on the CD.